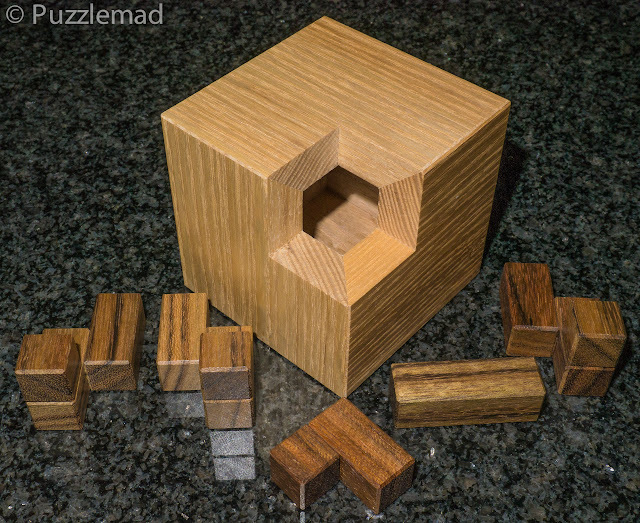 Puzzlemad New Additions: Happy Xmas - She's Going to Kill Me! Happy Xmas - She's Going to Kill Me! How many burrs does a man need? Well the answer to that has to be "more than he can possibly solve"! I already have a backlog of burrs but that hasn't stopped me buying more and I already own the Ultimate Burr set which I bought from Jack Krijnen earlier this year and I was extremely lucky to be able to obtain a wonderful copy of the level 5 burr set from Master Wu. These provide 1000s of potential challenges which I am finding extremely difficult to solve - I am much better at taking things apart than putting them together. 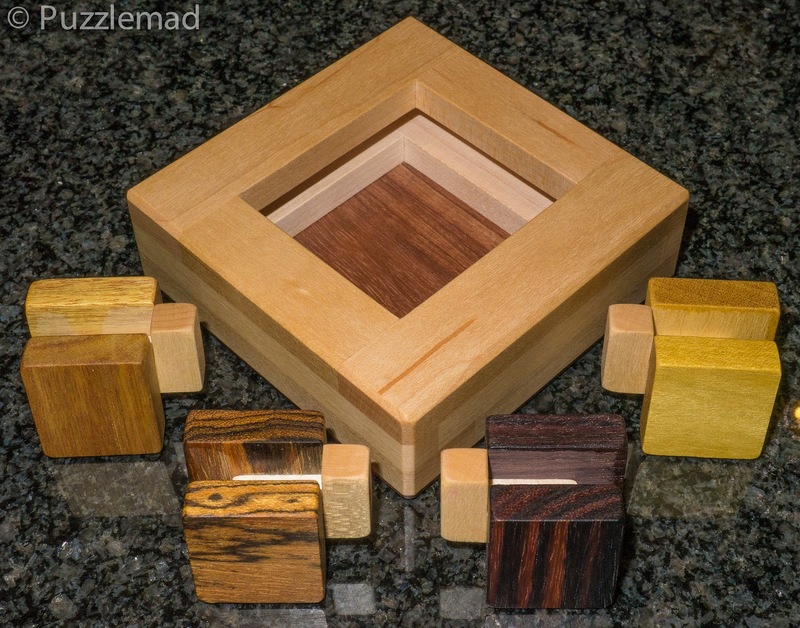 Jerry McFarland has been chatting about producing a burr set with me for a couple of years now and has finally solved all the problems associated with the box and a few have been produced. I am the lucky recipient of Burr set #2 - he has called it the Caramel Case because his wife thought it looked like a box of caramels. 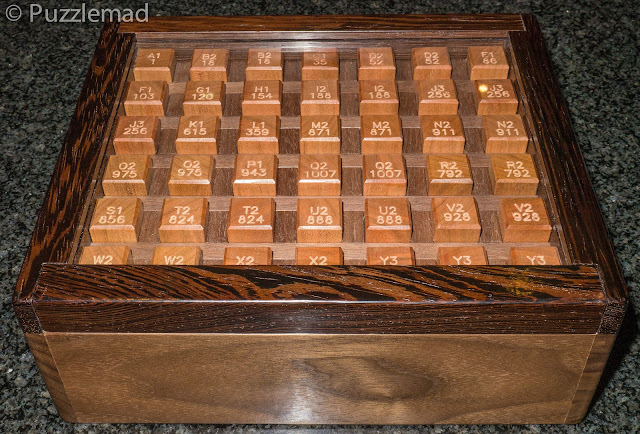 It is absolutely stunning made from Walnut for the grill and box sides, Cherry for the trim and puzzle pieces (which are beautifully engraved using the standard numbering) and Wenge for the trim. The case is sealed with an acrylic lid. Jerry also added in an extra piece (labeled 555) to allow me to make Bill Cutler's level 5 burr). The pieces are all 6 units long and so it has the ability to make many more puzzles than the standard 314 solid 6 piece burrs that went with the original set. A good friend of mine has done some interim analysis using Burrtools and there may be 311409 puzzles between level 1 and level 8! Yeehaw! This might keep me going for the rest of my life! Unfortunately for me a few more puzzle packages were received by she who must be feared all in the same week! Next I received a couple from Tom Lensch - these were puzzles he made from the IPP design competition this year. First of all, I cannot resist N-ary puzzles and here is Racktangle designed by Goh Pit Khiam. 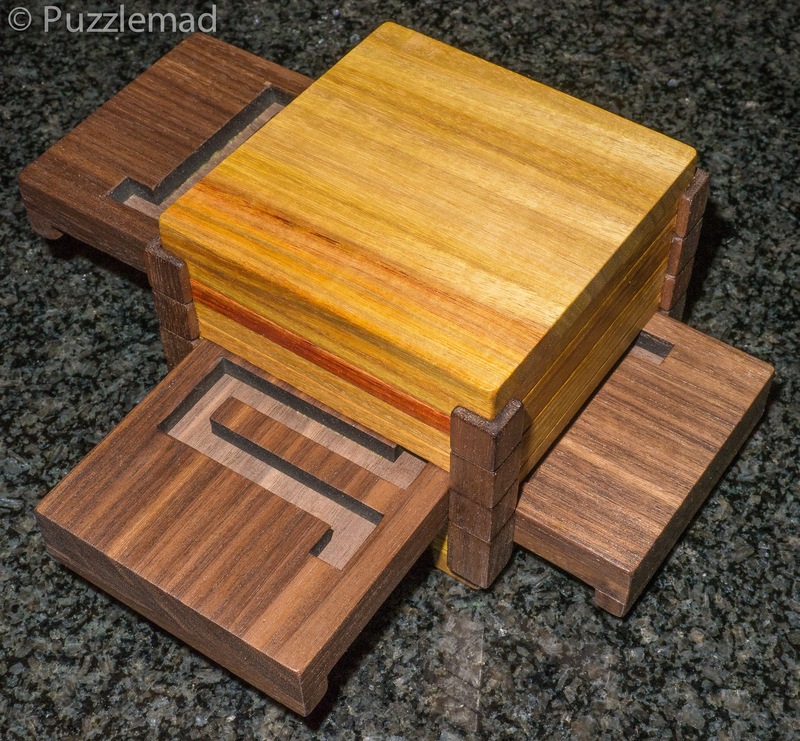 It has 4 plates in the built puzzle and there are another 3 provided to make a possible 8 puzzles. 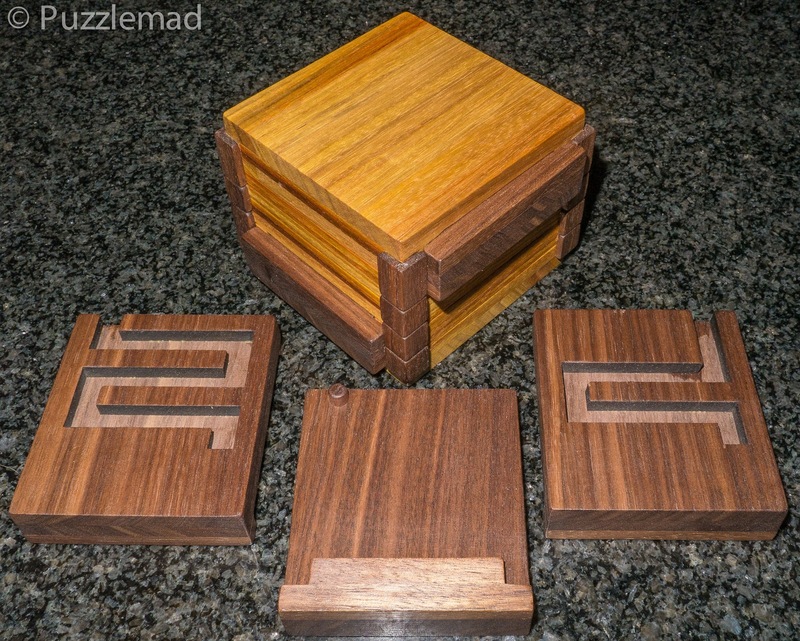 Made with a Canarywood rack, Walnut corners and pieces it is beautiful and smells gorgeous. Next from Tom was the Road Blocks puzzle - also designed by Goh Pit Khiam made with a Maple box and pieces from Bocote, Indian rosewood, Yellowheart and Canarywood. The aim is to place the 4 pieces inside the frame. It looks easy but the frame has differing internal on the top and bottom and is not centred properly. Finally (so far) I received 2 more from Eric Fuller. Packira really excited Eric and so I had to have one. 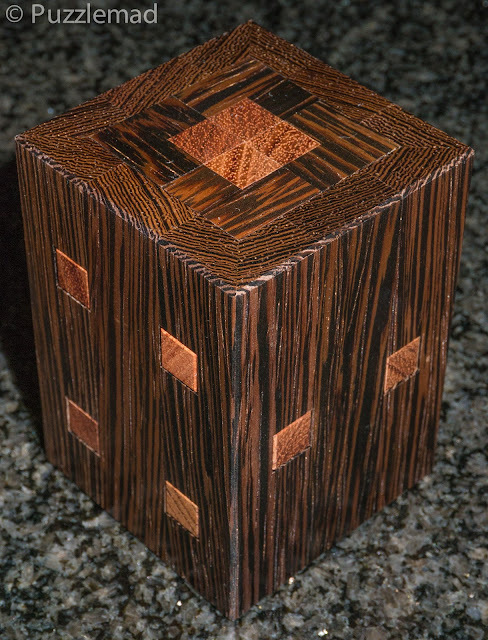 Designed by Tamas Vanyo and made from Wenge and Bubinga it is a mixture of Burr, Maze and lock picking puzzle. I haven't even started on it yet but a casual fiddle revealed that it will be very tough. I am no good at packing puzzles but this one, One Hole, from Bram Cohen seems to be a combination of burr and packing puzzle and had a huge amount of special workmanship put into it! It is made from Ash and Shedua and despite having over 40,000 possible assemblies only one is possible through the hole in the box with a level 6.2.3.4.5 solution. It arrived assembled so I immediately took it apart without paying attention to what I did and have spent a couple of hours failing dismally to pack it back together! Nice one Bram and Eric! One Hole - I can't seem to reassemble it! Don't tell Mrs S but there might be one or 2 more on their way. Whack! Ouch! Oops... she seems to have heard me!